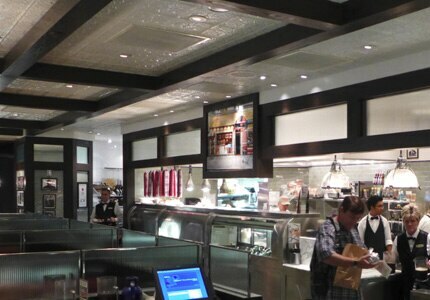 Classic deli cuisine, served by an enthusiastic and cheerful waitstaff at The Mirage. : This sparkling deli, designed by Adam Tihany, presents all the specialties made famous in New York City's since-shuttered landmark. Eggs and omelets are served all day, and breakfast specialties include a ham and egg sandwich, lox and bagel, and corned beef hash. Latkes, sauerkraut, potato salad and bagels with a schmear of cream cheese are among featured sides. Order the traditional chicken soup, with or without matzoh balls. The Woody Allen sandwich with lots of pastrami and corned beef is a favorite. Among gargantuan sandwiches that are Carnegie's signature is the turkey club, which has three decks of roast turkey, bacon, tomato, lettuce and mayonnaise. From an array of sweet temptations, we like the truffle torte cheesecake --- chocolate mousse combined with the deli's famous cheesecake.